The MicroCam offers the perfect mix of color imaging capabilities, small size, lighting, radiation tolerance, and economy. Due to its compact diameter of just 1.125” (29mm), this camera is perfectly suited for monitoring reactor activities in dry and submerged confined areas with relatively low dose rates. 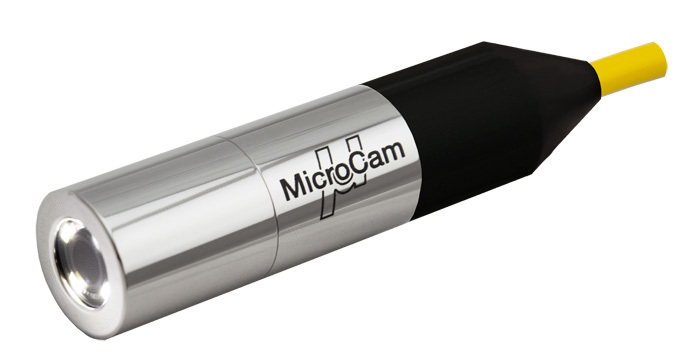 The MicroCam is also designed to be an economical choice and is available at a lower cost than other small diameter cameras on the market. The MicroCam is engineered to meet the specific needs of reactor services and outage teams, ensuring that detail and fidelity remain strong throughout a range of distances, radiation levels, and environmental and lighting conditions. It’s also environmentally sealed and has an ultra-wide vibration spec, rated to operate reliably underwater to depths of 200 feet with an incredibly high resistance to impact. The MicroCam incorporates a state-of-the-art APS sensor with impressive picture quality, low-light capabilities, and tolerance to radiation. Equipped with an integrated LED ring that can be toggled on and off, the MicroCam provides an excellent picture in virtually all lighting conditions. With zero tuning or set up required, the MicroCam is designed for ease of operation. Technicians using the MicroCam don’t have to worry about any type of camera adjustments either; the iris and focus operate on their own. This utility tool simply needs to be plugged in and it’s ready to go. The MicroCam is designed and manufactured to stringent quality standards. All stages of the production cycle, through final factory acceptance testing of the finished products, are performed under the tight parameters of Diakont’s ISO 9001-certified Quality Management System. High camera reliability is achieved through solid design, and incorporation of the highest quality components. Diakont routinely performs radiation tests of components and completed camera systems in order to validate performance to specifications.